Terminal South is one of two injectors for the High Current Injector “HSI“ for GSI’s Universal Accelerator UNILAC. This terminal hosts the Penning Ionization Gauges (PIG sources) solely. On high potential ions are created in the source and charge separated in the source dipole field. After being focussed they are post-accelerated (up to 130kV) to ground potential, where mass separation takes place. Terminal South is also historic, because the PIG ion source is used at GSI since the beginning of the accelerator research at our facility in the 1970ies. Terminal North is the high current injector for the UNILAC. The ion sources used on this injector are MEVVA, VARIS, MUCIS, MUCIS NEW and CHORDIS in order to supply a wide range of ions produced out of gaseous and solid states. Ions from hydrogen to uranium are produced and pre-accelerated. Extracted ion beam currents reach up to 300mA depending on the element. The ion beam is post-accelerated to 2.2keV/u for RFQ injection. These sources usually run with a low duty cycle of up to 5Hz. The High Charge State Injector (HLI) with its 14.5 GHz CAPRICE ECRIS was established as an injection line for the UNILAC at the beginning of the 1990s. 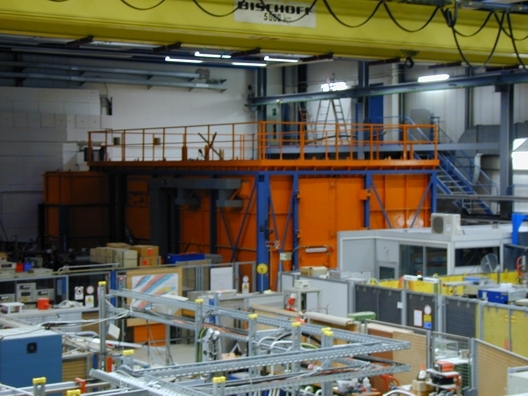 The large number of experiments served with UNILAC beams requires a great variety of highly charged ion species including isotopically enriched samples for ion beam production. An ECRIS is used as ion source because it can work without limitation of duty cycle in CW mode as well as in different pulsed modes with enhanced intensities. In the ECRIS plasma long ion confinement times are possible so that very high charge states can be extracted. This makes post-acceleration avoidable and facilitates the direct injection into a compact pre-accelerator consisting of an RFQ and an IH-structure. The appropriate input velocity of 2.5 keV/amu for injection into the pre-accelerator and the maximum mass/charge ratio of 8.5 determine the choice of ion charge state and extraction voltage, respectively. Typical ion charge states are Mg5+, Ni9+, or Xe18+. The respective extraction voltages are between 5 kV and 22 kV. The operation of the ECRIS is characterized by long time stability and good reproducibility of ion beam properties. The low energy transport line comprises a solenoid lens and a high resolution split dipole magnet spectrometer to separate the ions of selected mass/charge ratio.